The Left has raised questions about how Alexandria Ocasio-Cortez will conduct herself in office. By attending a protest in Nancy Pelosi’s office and coming out strong against Amazon in New York City, she’s off to a strong start. 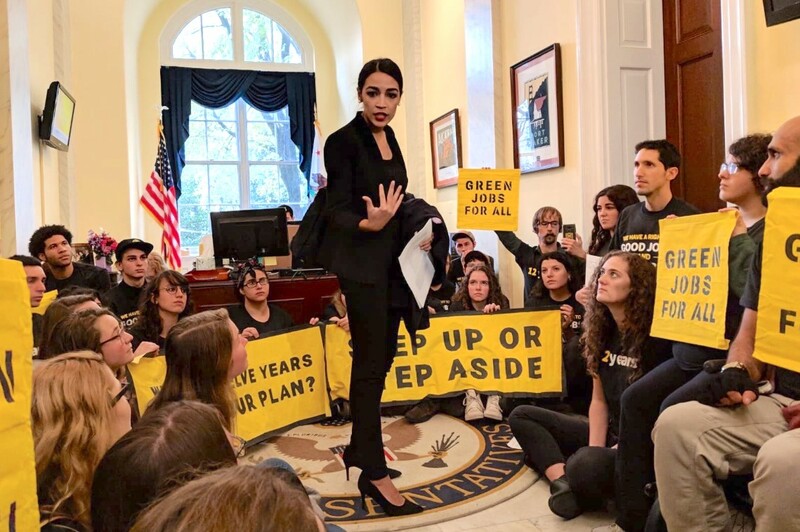 Ocasio-Cortez has drafted a resolution calling for House Democrats to create a new committee that would have the power to draft a “Green New Deal” bill by 2020 — one that would create a public works jobs program and transition the country toward renewable energy. Significantly, the resolution demands that no member of Congress — from either party — who accepts donations from the fossil fuel industry would be permitted to sit on the committee. While the first part of the bill is easy for almost any Democrat to agree to in theory, the second part, in naming a specific enemy, forces party leadership to pick a side: big donors or victims of climate change? Regardless of the specific demands, which in this case are necessarily constrained by the rules of the House, Ocasio-Cortez’s willingness to stand with protestors from a little known group inside the head of her own caucus’s office before she is even sworn in indicates that she is prepared not only to buck protocol and take on high-ranking national Democrats, but to use her office as a center of organizing for progressive causes. In fact, between state and city giveaways, Amazon may get as much as $3 billion in public money. Once sworn in, Ocasio-Cortez will represent working-class neighborhoods directly adjacent to the proposed Long Island City Amazon office. As with the demand to exclude congress members who take money from fossil fuel companies from making decisions that affect the climate — and as with her campaign — Ocasio-Cortez drew a line directly between the rich and powerful and everyday people. Ocasio-Cortez has consistently framed issues on class terms, pointing out in various instances that the rich are rich because the poor are poor, that average people suffer because of capitalists’ actions. In doing so, she helps to raise class consciousness far more than almost any Democrat aside from Bernie Sanders. In supporting sit-ins in her own party’s office, she demonstrates an understanding that constant community organizing is necessary along with legislative power. While we can’t know what course Ocasio-Cortez will take once she comes under the full institutional pressures of the Democratic party, the Left should take heart in her early steps — and support her to push further.